Did you know that turmeric, the popular spice that gives curry its distinctive yellow color, can be grown right in your own home? Thanks to this informational video by Brighteon user Preaching to the Choir, you can grow organic turmeric indoors. To grow any herb or spice indoors, you’ll need to start with a clean source. Since you want to plant turmeric, obtain organic turmeric from a local grocery store, health food store, or at a farmer’s market. Use good potting soil. You can purchase organic soil, or you can make your own nutrient-rich soil mix. When choosing a pot, consider a terracotta pot that “breathes.” This means the pot allows for a bit of correction if you over-water the plant. If you’re purchasing a glazed pot, avoid ones made in China. China-made pots will have a glaze that goes all the way inside the pot. You’ll need a pot that isn’t fully glazed so air and water can move through the sides. Air movement can help stimulate root growth, which results in healthier plants. In the colder months, avoid over-watering turmeric; it only needs sporadic watering. Don’t use fertilizer, which will cause more harm than good, especially when you’re trying to cultivate organic plants indoors. As for light exposure, turmeric will grow under southeast exposure to west exposure. However, light from the south and southwest is best for the turmeric plant. This usually applies to individuals who live outside of USDA Zone 9. If the temperature inside your home is near 60 F, turmeric will actively grow. Since you’re growing the plant indoors, you won’t have to worry about exposing the plant to freezing temperatures. Turmeric is hearty from 30-40 F, but not for a sustained period. To accurately assess the plant yield, start with one rhizome. This way, when you first harvest the turmeric you can easily gauge its growth. If you want to plant several rhizomes in one pot, take a photo before you cover them in soil so you can check how each rhizome has grown. Try to leave the plant in one spot, or at least avoid bringing it outdoors, then bringing it indoors when the weather turns cold. This can help prevent the spread of bacteria, fungi, or insects, which will be bad for the turmeric and any other plants that you have growing inside your home. In India, turmeric is often used as both a spice and a potent medicinal herb. Modern research has proven what Indians have known for thousands of years; turmeric contains compounds with medicinal properties. Some of these compounds are curcuminoids, with the most important one being curcumin. Curcumin is the main active ingredient in turmeric. This crucial curcuminoid has potent anti-inflammatory properties. It is also a very powerful antioxidant. The curcumin content in turmeric isn’t that high. It’s at least three percent by weight. A lot of studies on turmeric use extracts that are mostly made up of curcumin. For these studies, dosages often exceed a gram per day. Reaching these levels will be difficult if you only use turmeric as a spice when cooking. 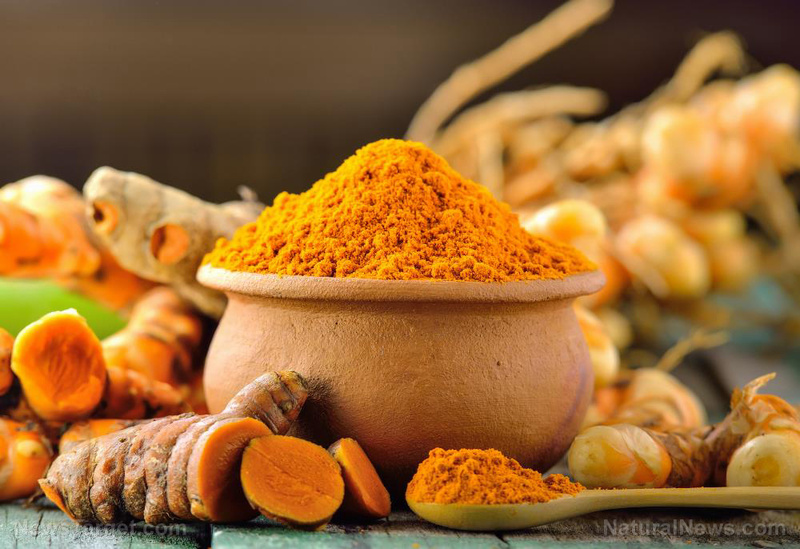 To reap the full benefits of turmeric, you can take a supplement with significant amounts of curcumin. Curcumin is poorly absorbed into the bloodstream. As a workaround, you can consume black pepper with turmeric. The former has piperine, a natural substance that boosts curcumin absorption by a whopping 2,000 percent. View the full guide by watching the video at this link. Learn more about growing your own spices indoors at HomeGardeningNews.com.